OSWEGO, NY – The Oswego County Legislature’s Human Services Committee recently presented Kathleen Fenlon with a certificate of appreciation for her 35 years of service. She received a standing ovation from legislators and guests at the March legislature meeting. 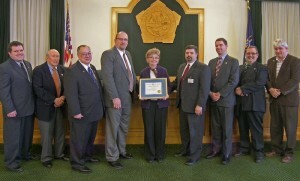 Pictured from left are legislators Daniel Farfaglia, District 24; John Proud, District 7; Committee Vice Chairman Ronald Sakonyi, District 5; Committee Chairman Kevin Gardner, District 13; Fenlon; Oswego County Administrator Philip Church; Shawn Doyle, District 3; Douglas Malone, District 20; and Daniel Chalifoux, District 19. Fenlon is retiring from her position as director of the Oswego City-County Youth Bureau. All of us have recognized her commitment to youth and her dedication to providing services to youth to help them become successful, he added. She has been a prolific grant writer, and her abilities as a leader and a manager are well known. She has been recognized by the state for her abilities as well. She has served as the treasurer and executive board member of the State Association of Youth Bureaus (and they honored her for her ‘out of the box thinking’). She has also served as president of the United Way board of directors, member of Integrated Community Planning of Oswego County, Workforce Development Board, Weston Hyde Foundation, Zonta, president and vice president of the Oswego City School District board of education, Oswego County Child Care Council, Child Protection Advisory Council, Take Charge Coalition – and many others. She has also received several local awards. During budget meetings the past two years Fenlon told the county administrator, “I don’t know if I’m going to retire yet or not. Maybe this year or maybe the following year,” he recalled. “The most important message that I have learned is how important it is for the community to help raise our young people. The young people need community support and to have opportunities,” Fenlon said. All kids have strengths, all kids have interests and all kids have skills, she said. “But, the kids aren’t born with that stamped on their forehead. The community needs to afford them the opportunity to find out what it is that they want to do. They need to try things out. They need the opportunity to learn to work together, to work out differences, to appreciate the differences in other kids,” she explained. That is why the community needs to support its youth, she pointed out. “They will sit in our seats one day and do a better job then we do; they will the leaders of our future,” she said. Thank you, Kathy, for all the wonderful summers our daughter spent at Camp Hollis. Your leadership made our childhood more than memorable for her. It made it memorable for a lot of the children who spent those summers with her. Hope ‘retirement’ is a pleasure, even though we know you’ll never stop being busy with your new artistic endeavors, and travel, etc. Can’t really picture you slowing down! Thank-you for many years of valued, genuine service to all the people of our county. I’ve always enjoyed our interactions and valued your knowledge and experience. Wishing you all the best in your retirement.